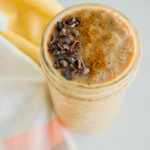 The best part of waking up will now be this keto iced coffee smoothie in your cup. Let’s take a closer look at what makes this smoothie so great. Coffee contains loads of antioxidants, which fight toxicity and help slow down the aging process. Bananas are loaded with potassium, with about 500 milligrams per banana, which is absolutely crucial for those who frequently exercise. This is because potassium acts as an electrolyte and helps manage blood flow, promotes circulatory health, and helps oxygen reach your cells [*]. Bananas also help regulate sodium, water retention, and circulation in the body [*]. Although they have 27 grams carbohydrates per serving, bananas certainly have many benefits and can be added in moderation to your low carb keto diet. Let’s talk about cinnamon. According to studies, out of twenty six popular herbs and spices, cinnamon ranked number one in terms of its protective antioxidant levels [*]. With its high levels of antioxidants, a little can go a long way. Even as little amount as ½ a teaspoon can have positive effects on your digestion, blood sugar levels, and more. Coconut cream can help lower cholesterol and blood pressure, improve digestion, improve blood sugar levels, and prevent fatigue. Because coconut cream is high in healthy fats, it helps prevent overeating and snacking. About 93% of its calories comes from medium chain triglycerides, which means it may help enhance physical performance, increase energy expenditure, and reduce the risk of joint inflammation. This smoothie can be drank solo or alongside something equally delicious, like these fluffy keto waffles. Regardless, this deliciously simple drink is sure to become a morning staple in your household. Add everything to a high speed blender, blending until well combined.